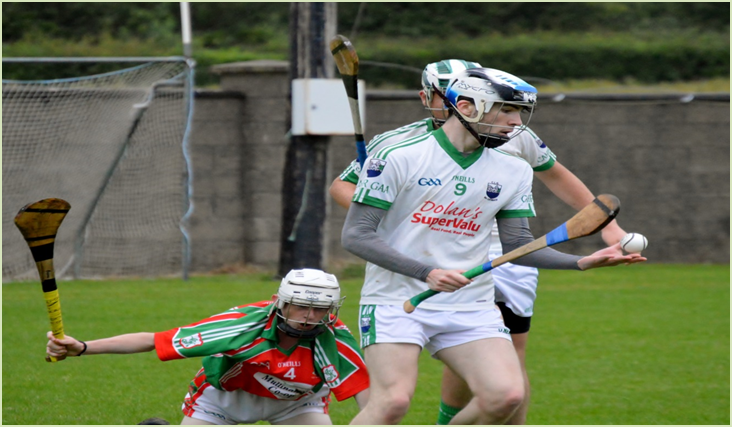 On Sunday last we went to Monroe to play the junior” A” hurling quarter final against Grangemockler/Ballynale, Cahir drew first blood with a pointed free from Daire O'Brien, that was the good side of things, on four minutes Dean Lonergan got a straight red, Cahir now had a right battle on their hands and on thirteen minutes things got worse as our opponents raised the green flag, our men kept at it with a few points of our own and on twenty eight minutes Dire O'Brien hit the back of the net to keep us in the match and at the break the score read Cahir 1-05 Grange/Bally 1-07, the second half was a hard fought affair, both teams exchanged a point and on the thirteenth minute two yellows for Daniel Moloney (unlucky to get the second) Cahir were down to thirteen men, sub Benny Hickey added a couple of points to level the game with fifteen to go, Grangemockler/Ballyneale added a few points of their own and they found it hard to pull away from a plucky Cahir outfit, on time up Benny Hickey goaled and that just left two points between us, but sadly our tired lads could not get any more scores and the final whistle went. 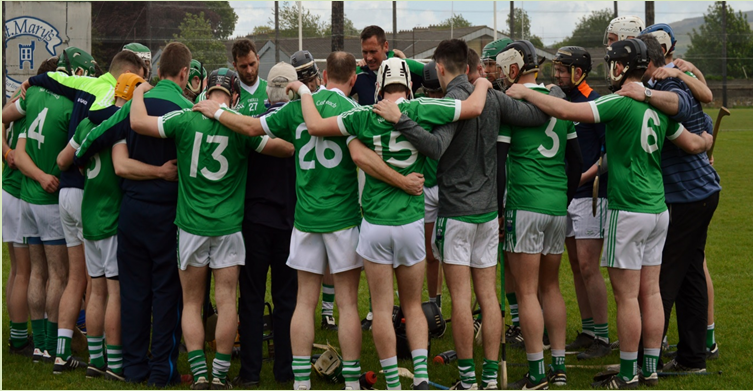 Cahir 2-08 Grange/Bally 1-13 was the final score, as that was a quarter final that's the end of the road for our junior A hurlers for 2017 thanks to all the panel of players for their commitment over the year, and to the management team of Barry, Paddy, Richie, Davy and Benny thank you all, team and scorers: Keelan Hickey (0-1), Patrick Meehan, Kieran O'Dwyer, Ger Hally, Ryan O'Donnell, Conor Cashman, Dean Lonergan, Niall McKenna, Ryan Murphy, Daire O'Brien (1-2), Daniel Moloney (0-1), Ian Flannery, Johnny McMahon (0-1), Mikey O'Connor (0-1), Alan O'Connor. Subs Used: Benny Hickey (1-2), James McGrath, Johnny B. O'Brien. Ourselves, Ballingarry and Mullinahone are in a three way play off to see which two teams can go forward to the next stage of this competition, and it was the latter that we faced on Wednesday evening last in Kilsheelan. The opening ten minutes saw both teams cancel out each other with points from our own Pa Meehan (two) and the same amount from Paulie Barrett, a purple patch by our opponents from the fifteenth minute to the twenty second minute, saw them score four unanswered points, with a couple of minutes to the break club man Nicholas Reidy pulled off a great save, but from the resulting puck out, unfortunately the ball went straight to the team in green and red and they punished us to the maximum, half time Cahir 0-05 Mullinahone 1-09, (pictured Dylan Fitzgerald ). The second half started with a change of goal keeper for Cahir as Nicholas was brought out field and into goal went Conor Kirwan, Mullinahone were the better in this half and within ten minutes had the green flag raised for the second time in the game, a point from play and six frees was to be the total for our lads in this half and it finished Cahir 0-12 Mullinahone 2-13, we now have to play Ballingarry and get a result if we have any chance of going forward in this year's championship, best of luck to all the panel for the next game,(we will publish fixture as soon as we get it) , team and scorers: Nicholas Reidy, Conor McKenna, Ger Quinn, Eoin O'Neill, Tommy McDonagh, Colin McEniry, Eoghan Kelly, Cavan Mckenna (0-1), Dylan Fitzgerald, Mark Casey (0-1), Patrick Meehan (0-2), Sean Murphy, Christopher McDonagh, Paulie Barrett (0-8), Eoin Rowe, Subs Used: Conor Kirwan, Cillian Conway. Congratulations to our senior hurlers who beat Clare, and are now in the last four of the all-Ireland, and to our senior camogie who are through to an all-Ireland quarter final, after their win over Offaly, well done to all. The clubs draw for the month of July was held last Friday evening in Newtown Nenagh, we just had one winner and that was Martin Hickey who won €500 (well done Martin, thank you to all our supporters who signed up to the draw with our club this year, let's hope we can keep our luck going and fingers crossed we might get a car or two to Cahir before the draw ends. Our weekly fun game draw the joker is getting very exciting and we thank you all for your continued support, last Sunday we were in the Shamrock Lounge, and as always Hughie and Margret looked after us all very well, this week's winners: Gloria Boles, Denny Whelan, Ned Doyle, Jim Cantwell, Patrick Caplice. Next week the Draw will be held in the Punters Rest and the Jackpot will be €11,400. 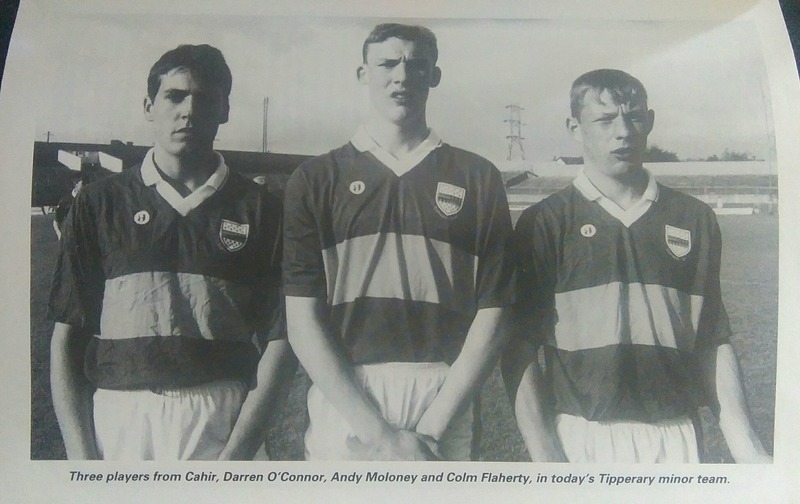 The three Cahir men (above) Darren O'Connor, Andy Moloney and Colm O'Flaherty lined out for the Tipperary Minor team but what year? ( thanks to Cahir Media for the photo) we will tell you the year next week.